The structure that emerged during the composition of Sonata 1997 was a series of short sections with a hiatus of one to two bars between them. I placed these short sections into a series of 8 ABCBA arch structures. 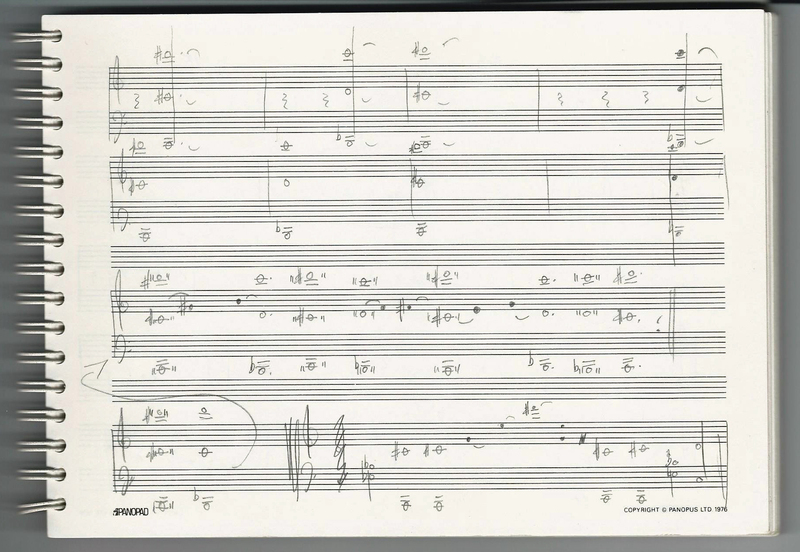 Once I had one ABCBA section I could perceive the scale of the whole composition. The sonata opens with a section based on a 12 tone row. Other sections use a limited pitch palette and the composition ends with a coda consisting of a repeated-pitch cadence. The illustrations are a section of my notebook from February 19? and the corresponding sections in the typeset score. On the notebook page you can see how I changed the way the chords are written from fully notated rhythm to a series of double whole notes; and on the lower right of the page, the opposite.